For years we have satisfied those in need of a guitar humbucking sized pickup fpor basses. The Pitbull Humbucking has been installed in Les Paul Basses, Steinbergers, Epiphones, custom builds, and a slew of other cool instruments needing a pickup with those dimensions. Many problems have been solved and much awesome tone has been released. The one Pitbull humbucking for bass has delivered the goods while recieving praise and zero complaints (no complaints, but some questions). Now, in response to the question "do you make a neck and a bridge version, or is it just one model?"........ 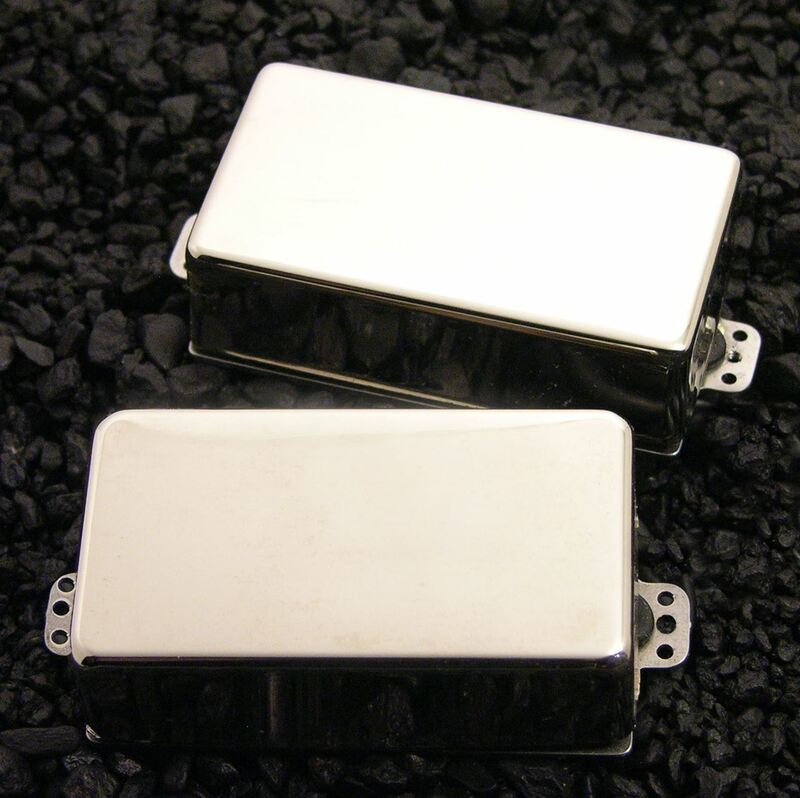 we have introduced the Pitbull Humbucking Set. By default, we now offer a neck and a bridge version of a steadfast boombox of a tone generator to help you balance output when two pickups are required. Electrical output and magnetic power have both been enhanced for the new Pitbull Bridge pickup, while the neck version remains the same trusty beast we have been producing for over 15 years. So, when you need the look, the power, and the awesome single coil splittability of our true-splitting humbuckings, check out the new Pitbull Humbucking set, or either one of the uniquely different single pickups. Both come stock with 4 Conductor cable and a variety of closed cover and open coil configurations and colors. For years we have satisfied those in need of a guitar humbucking sized pickup for basses. The Pitbull Humbucking has been installed in Les Paul Basses, Steinbergers, Epiphones, custom builds, and a slew of other cool instruments needing a pickup with those dimensions. Many problems have been solved and much awesome tone has been released. The one Pitbull humbucking for bass has delivered the goods while recieving praise and zero complaints (no complaints, but some questions). Now, in response to the question "do you make a neck and a bridge version, or is it just one model?"........ we have introduced the Pitbull Humbucking Set. By default, we now offer a neck and a bridge version of a steadfast boombox of a tone generator to help you balance output when two pickups are required. Electrical output and magnetic power have both been enhanced for the new Pitbull Bridge pickup, while the neck version remains the same trusty beast we have been producing for over 15 years. So, when you need the look, the power, and the awesome single coil splittability of our true-splitting humbuckings, check out the new Pitbull Humbucking set, or either one of the uniquely different single pickups. Both come stock with 4 Conductor cable and a variety of closed cover and open coil configurations and colors. Was looking for a passive alternative on my hohner b2 Steinberger-copy, big improvement on the bottom end compared to the original EMG Select pups. Super warm. Love this pickup. Have a set on a custom semi hollow fretless bass and I couldn't be happier.